Brave Browser might be something new for you as you might not heard about it like other popular browsers such as Mozilla Firefox, Google Chrome, Safari, Opera etc. Brave browser not only provides you to browse internet with blazing fast speed but it also allows ad free browsing. On other hand Brave Browser has its own Publisher Program Network which allows you to earn extra money online from your YouTube Channel and your blog. 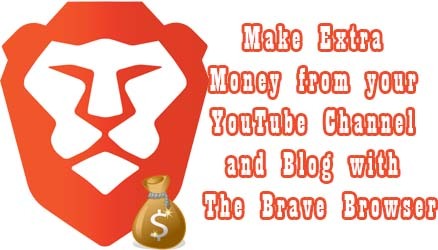 So in this post we will guide you in detail on how to make extra money online from your YouTube Channel and Blog with The Brave Browser. 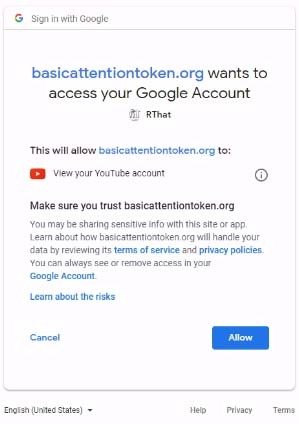 As we said earlier that The Brave Browser enables users to experience ad free web-browsing, so this reason makes users to opt for this web browser. But the fact is if you are monetizing your website or YouTube Channel, and if your audiences browses your website or YouTube Channel via Brave Browser you will lose your revenue as they are browsing your site or YouTube Channel without any ads. So to fetch extra money from audiences browsing your site or YouTube Channel via Brave Browser, you can use Brave Publisher Program. By monetizing your website or YouTube Channel with Brave Publisher Program you will earn BAT Tokens which is a crypto currency. Later on you can sell these earned BAT Tokens for Bitcoin or flat currency. Register an account using your email id at Brave Publisher Program. Hope you have signed up on above both sites, next you will have to navigate to Brave Publisher Dashboard and connect your Uphold Account. Once you finish up connecting your Uphold Account with Brave Publisher to receive payments, you are done with the setup of both these accounts. One final step left will be you will have to configure preferred deposit currency from the list, in my case I selected BTC. 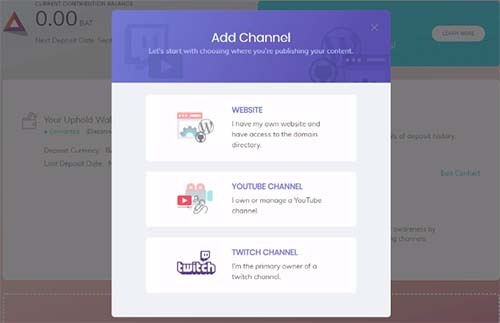 Next to start earning you will have to add your YouTube Channel or your website to Brave Publisher Account. Below are the steps of add both YouTube Channel and Website to Brave Publisher Account. To add your YouTube Channel from Brave Publisher Dashboard just click on Add Channel button. From options, select YouTube Channel. If you are not yet signed in into your YouTube Channel then just enter your credentials and sign in into your account and select the channel which needs to be added. It will ask permissions to access your Google Account, so to proceed just allow it. 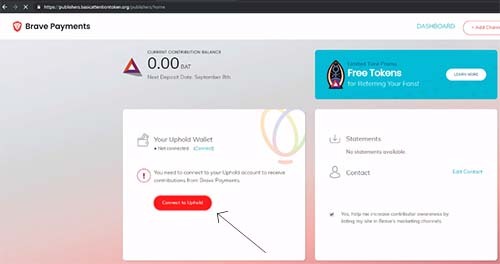 Your YouTube Account will show up in your Brave Publisher Dashboard and on side it will also show up BAT Tokens earned. That’s It, you have successfully added your YouTube with Brave Publisher to start earning extra money. To start earning extra money from your website with Brave Publisher Program, from Brave Dashboard just click on Add Channel Button. Click on website option, enter your domain name and click on continue button. Depending on CMS on which your website is build you will have to verify your website via DNS or via plugin in case of WordPress Site. Configure the DNS or plugin and get your website verified to start earning extra money. Once configuring the DNS or plugin, your website would be successfully added to Brave Publisher Program. When any of your audiences visits your website via Brave Browser, you will earns BAT Tokens. 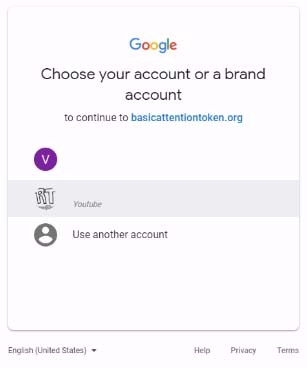 However if you have Twitch Channel, you can also earn BAT Tokens by adding your Twitch Channel.